Scuba and snorkeling are both popular sports that are enjoyed by many all around the world. Venezuela borders the Caribbean Sea which allows divers to see a wide range of aquatic species. Some of the best places in Venezuela to view the coral reefs and fish are Henri Pittier National Park and Margarita Island. Both of these locations contain a wide range of coral reef, fish, and shipwrecks for people to see and explore. 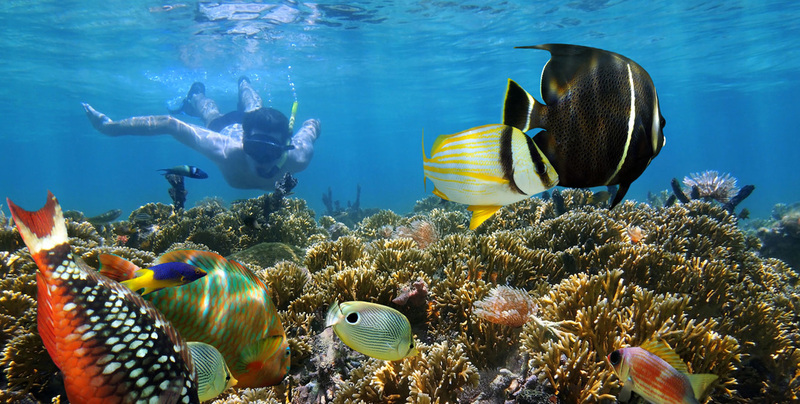 Due to its location, diving and snorkeling is done year round in Venezuela. Many commercial companies exist allowing tourists to enter the water and witness the beauty Venezuela has to offer below the water. Margarita Island is the most desired travel location by tourists and the beautiful waters bring divers and snorkelers from all around the world. I absolutely love guacamole so when I saw Guasacaca it caught my attention. Guasacaca is a Venezuelan twist on the very popular food guacamole that it is made mainly with avacados, garlic, and vinegar. This versatile combination can be served with a variety of foods such as arepas, chips, and various meats. Guasacaca is made by combining all of the desired ingredients into a blender then letting the mixture sit to allow the flavors to combine and set. As with many foods around the world, there are many different recipes and adaptations that have been made to guasacaca. If it is to be eaten with meat and act like a sauce, the guasacaca should be made more thin. If you would like to eat it as a dipping sauce for arepas or bread then it should be made to have a thicker consistency. Guasacaca is commonly served at room temperature. Below is the list of ingredients and the cooking method of common Guasacaca. Combine all of the ingredients listed above into a blender, food processor, or mixing bowl. Mix until desired thickness and consistency is achieved. Wait atleast 1 hour before serving to allow flavors to blend together. Bull fighting, or the corrida de toros, is a Venezuelan tradition that can be traced back to colonial times. The roots of bull fighting can be traced from Spanish and Llanero influence. Ships from Europe brought bulls and cattle to South America where they found home in the plains. Today, bull fighting is a Llanero tradition and is celebrated because of its cultural importance. To many, bull fighting isn't considered a sport but an art form. This traditional act takes place at many important and popular festivals throughout the year in Venezuela. Feria Del Sol, also known as the Bull Fighting Carnival of America, is the most famous celebration that takes place in Merida each year. The festival consists of a week of bullfighting events, food, parades, and concerts. Coleo is another popular Llanero sport that involves bulls. The goal of this game is to pull the bull down by the tail while riding around on a horse. The person who tips over the bull the most in a set amount of time wins the game. Llanero and bull fighting, although a major part of Venezuelan culture, is considered wrong by many people around the world. The controversy of animal cruelty vs tradition is often brought up when debating if this act is right or wrong. Overall, no matter which side one agrees with, bull fightiing and coleo are both interesting parts of traditional Venezuelan culture that still live on today. Joropo is a Venezuelan musical style, with a related style of dance, that closely resembles the waltz. With influence from European This musical style originates from the Llanero people. A llanero is a Venezuelan herder or farmer who resides in the grasslands. Llaneros have a unique culture which includes a distinct style of music and Joropo is just a folk branch off of the the general genre of Llanero music. Joropo is traditionally played with a harp called an Arpa Llanera, bandola, cuatro, and meracas. The music is usually associated with parties and special celebrations. In Venezuela the Joropo is important to many people. A song called, "Alma Llanera", is a Joropo and is considered the second national anthem of Venezuela. This song is about the Llanero people of Venezuela and it celebrates the heritage of the people who helped shape Venezuela into what it is today. When one thinks of the natural beauty of Venezuela, vast landscapes of sandy beaches, luscious jungles, and mangrove covered mountains come to mind. Mochima National Park is a beautiful area of protected wilderness showcasing these things. The park is located on the northeast coast of Venezuela and goes through the states of Anzoategui and Sucre. It was established as a park in 1973 to protect over 200,000 acres including the Turimiquire Range and the aquatic landscapes found on the eastern coast. Mochima Park supports a wide range of life such as mangrove trees, many different types of coral and flowers, 78 different species of mammals (including 4 types of endangered sea turtles), and about 30 different species of reptiles. Popular recreational activities include snorkeling and scuba diving around the beautiful reefs and exploring the lush mountains. Mochima National Park was established on parts of land that was already occupied by humans. This has created problems due to urban development of the preexisting communities. The wildlife and ecosystem have been damaged due to things such as community expansion, mining in the area, and the highway that has been built through the park. In the future, I hope this park can keep as undeveloped as possible to preserve the natural beauty located within. Mendanos de Coro National Park is considered a must see place for anyone traveling to Venezuela. This park is located near the city of Coro right along the road that leads to the Paraguana Peninsula. Mendanos de Coro is famous for the Mendanos Sand Dunes and the park was created to preserve these natural beauties. Visitors are free to wander the dunes that can tower up to 40 meters high. Winds are constantly shifting the sandy hills, changing the landscape from day to day. Rainfall in this area is scarce so the vegetation is limited to small shrubs and bushes. In this area people enjoy the dunes through various recreational activities. Some of these activities include: Sandboarding, atv/dunebuggy riding, and running down the large hills. Due to the floods of 1999, large lagoons remain throughout the dunes. These lagoons allow visiting humans and wildlife to soak in the beauty of the surrounding desert. This place is very unique compared to the rest of the national parks located in Venezuela. Imagine yourself stepping into a Venezuelan celebration in the early 1800s. Bright floral patterns and wavy skirts flow with the bodies of the women dancing. A man is in the corner of the dance room is eating Arepas and wearing his best cream colored liqui liqui. The roots of traditional Venezuelan clothing can be traced back to influences from Spain, France, and the Caribbeans. The Spanish occupation of Venezuela has a huge impact on what traditional Venezuelan clothing looks like. Today, traditional clothing is worn on holidays or during weddings. Women typically wore long, decorative skirts and dresses often imprinted with a floral pattern. The blouses were often white and worn off of one or both shoulders. Ruffles were common in most blouses and skirts. Women would also typically wear a flower in their hair. Traditionally men wear Liqui liqui. These outfits would contain a pair of linnen, cotton, or sometimes wool jacket and pants. Often white, cream, beige, or tan, these jackets are plain and would be worn by men of all ages along with a hat. When one looks into the history of Venezuela, one major revolutionary leader is key to the independence of Venezuela from Spain in the 1800s. His name is Simon Bolivar, also known as "The Liberator", and his life is greatly celebrated throughout alot of South America. He was born on July 24th, 1783 in Venezuela. After spending a portion of his life in Europe he returned to Venezuela and led resistance movements against the Spanish to regain independence for his home country of Venezuela. 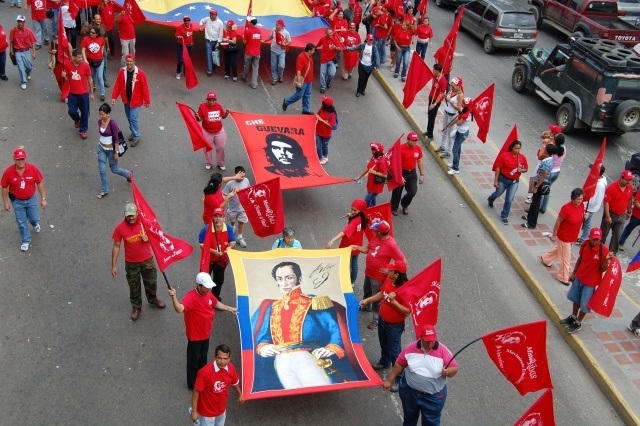 Every year on July 24th, the people of Venezuela come together to celebrate the life and legacy left behind by Simon Bolivar. The celebrations are filled with military parades, food, music, battle reenactments, and dancing. It is a time for Venezuelan citizens to unite and celebrate their rich history and display nationalism. This day is recognized as a National Holiday in both Venezuela and Ecuador and is celebrated every year. One historic and traditional Venezuelan food is known as an Arepa. 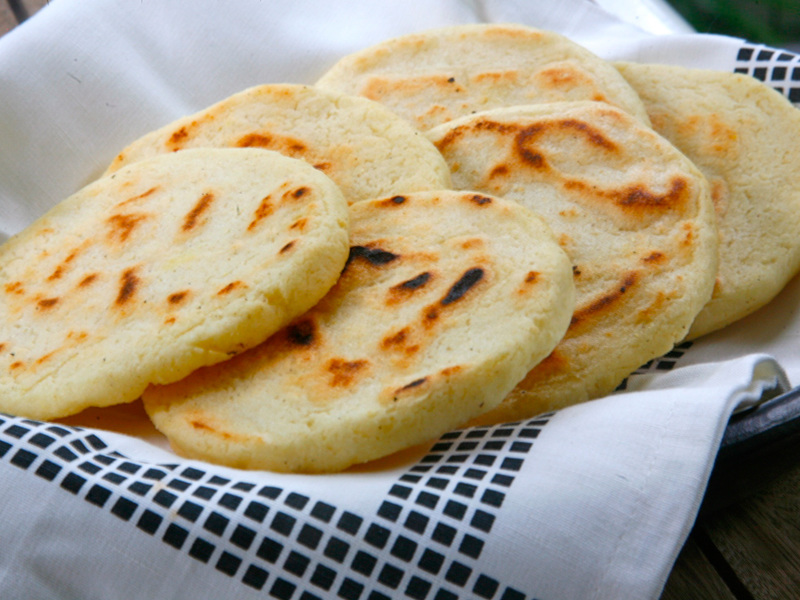 The origin of Arepas can be traced back to indigenous tribes of the land. Arepas are eaten by all people of all social classes in the country of Venezuela. It can be compared to bread eaten with all meals throughout the day in other countries. In Venezuela, Arepas are often split open and filled with various meats and cheeses and are cooked by being baked, grilled, or fried. Originally, Arepas were made with fresh corn but today they are usually made with pre cooked corn meal. Arepas are usually circular and when making them, the size is about the same as an average pancake. I personally recommend cooking them on a skillet on a stove top until the tops of the Arepas are slightly brown. 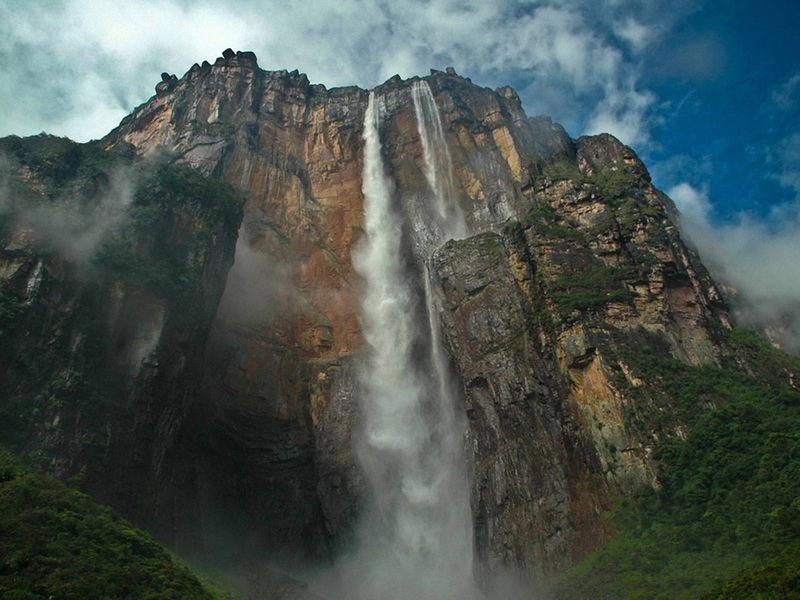 Angel Falls is the largest uninterrupted waterfall in the entire world. It is located in the western part of Guayana Highlands in Canaima National Park. The waterfall is over 3,000 feet tall, about 15 times taller than the world famous Niagara Falls. The water from Angel Falls flows from the Carrao River and drops into what is called "Devil Canyon." The waterfall is named after an American pilot named James Angel who was flying over the land and discovered the falls in 1933. He returned in 1937 and due to engine troubles, he had to land atop of the falls. Today, a replica plane sits atop of the falls in honor of James Angel. Angel Falls brings tourist from all over the world to witness its beauty and is a major landmark and natural beauty of Venezuela.